Walking with Jesus: Day 16: Matthew 7:1-14 & Psalm 16 - What does "Judge Not" Mean Exactly? Day 16: Matthew 7:1-14 & Psalm 16 - What does "Judge Not" Mean Exactly? What does "Judge Not" Mean Exactly? Judge not, that you be not judged. For with the judgment you pronounce you will be judged, and with the measure you use it will be measured to you.Why do you see the speck that is in your brother's eye, but do not notice the log that is in your own eye? Or how can you say to your brother, ‘Let me take the speck out of your eye,’ when there is the log in your own eye? You hypocrite, first take the log out of your own eye, and then you will see clearly to take the speck out of your brother's eye. 1. "Judge not" does not mean we cannot make moral choices and distinctions. Jesus certainly did not mean that we cannot call certain actions "right" and other actions "wrong." In this Sermon on the Mount, Jesus has already declared lust, insulting, worrying, divorce and other actions as sinful. 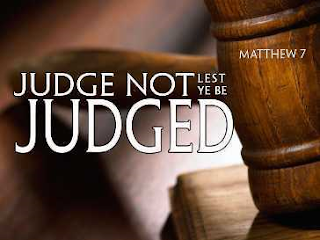 Agreeing with Jesus and Scripture and calling sin sin is not condemned by "Judge not." 2. "Judge not" does not mean that we cannot condemn or criticize the sinful actions of public figures. John the Baptist was arrested and imprisoned because he publicly condemned King Herod's action of stealing his brother's wife from him and marrying her himself. When public figures sin in public ways, it is perfectly legitimate for Christians, especially Christian leaders, to denounce these actions. This is part of proclaiming the truth and shepherding the flock of God. 3. "Judge not" does not mean that we should not lovingly confront someone who sins against us. In Matthew 18, Jesus says that if someone sins against us, we should go to that person and tell them their fault privately. Jesus told us how to properly and lovingly confront someone who has sinned against us, and we should do what Jesus taught. This is part of living in Christian community and is not "judging" behavior. So, what did Jesus mean? 1. We are not to condemn someone as lost or without hope or hell-bound. God alone sees the heart and God alone judges the heart. We cannot condemn anyone and we should be thankful that we don't bear that responsibility. 2. We should avoid assuming bad motives for peoples' actions. When you observe someone's actions, always assume the best possible motives for them. Only surrender your best assumption if it is definitely disproven. In other words, don't be quick to judge someone's motives. 3. Always be ready and willing to forgive. Know that you are sinful and stand redeemed only because you have been greatly and marvelously forgiven. Be ready to forgive when others sin, too. This is one of my favorite Psalms in the whole Psalter! In the summer of 2010, I preached a whole series of messages on this Psalm. You can find one sermon I preached on Psalm 16 on July 4, 2010 here or here. Heavenly Father, You indeed are my refuge, my rock, my shelter, my strong tower, my fortress, my protection, my sanctuary. I cling to You for protection; preserve me from my enemy and keep me in Your loving care. Father, You have blessed me with a wonderful church family. They are such an encouragement, such a blessing, such a joy. Thank You for them! Please keep and bless my church family. Knit out hearts ever closer together in Christ through the Gospel. Lord, idolatry is the road to sorrow. Idols disappoint and destroy those who worship them. Keep my heart from idols, Lord. Keep Your flock from idols and draw our hearts after You and You alone. Lord, when I think of how good You have been to me and to Your people, the word "beautiful" seems too mild. Our inheritance in Christ is too wonderful for words! That we should inherit the earth made new and share life with You forever is a joy beyond all telling. You are such a wonderful portion, such an incredible inheritance. Father, not only do You give us refuge and not only do You secure a wonderful inheritance for us at the cost of Your Son's life, but You even give us wisdom and guidance through Your holy word. As we hide Your word in our hearts, Scripture speaks truth to us even in our hearts in the middle of the night. Lord, You are the One who holds me, keeps me, protects me. Turn my eyes from worthless idols and let me always focus my eyes, me heart, my life on You! Father, these verses remind me that Jesus has ben raised from the dead, the firstborn of the dead, the head of the new creation, the author or eternal life. Because Jesus lives and I am in Him, I, too, will live forever in Him! Lord, this world promises pleasure, but it is empty, short-lived and stained by regret. Only in You and in Your presence can I find pleasures that last forever and leave no regret. Only in Your presence can my soul delight forever and never be disappointed. Oh, how I long for that day beyond the grave when I shall be with You forever. In Jesus' name, Amen!